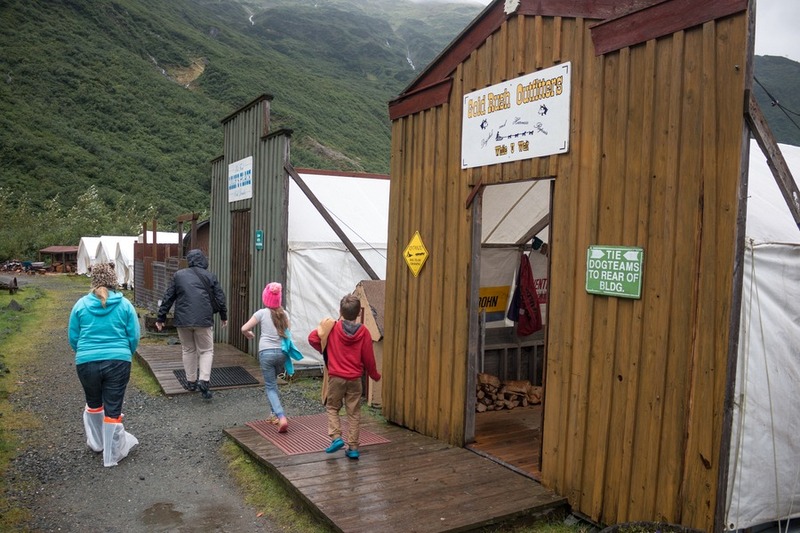 You’ve heard us rave about Juneau before with its vast glaciers and towering mountains. 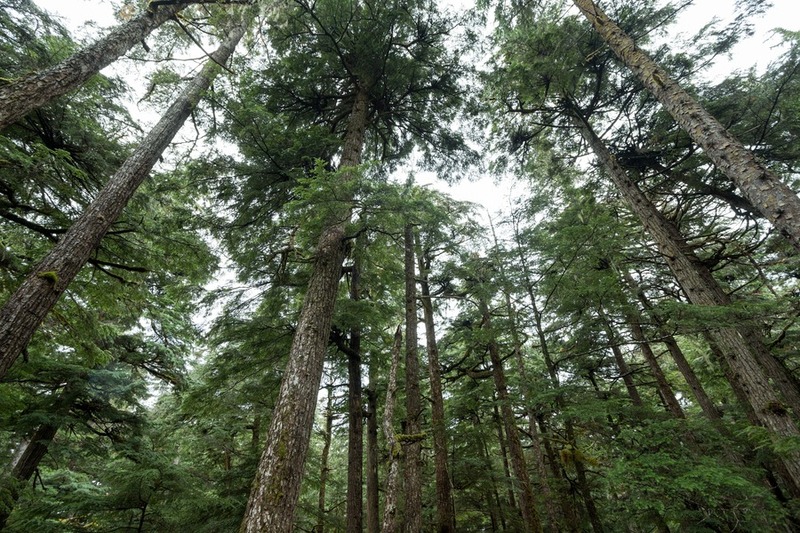 Juneau’s rich natural bounty is incredible in every way, and especially in the abundance of wildlife around every corner. So when Travel Juneau asked us back to discover more of this gorgeous city we jumped at it. If you are in love with animals, or just looking to spot a bear, then plan your summer trip to Juneau, Alaska for your wildlife dream trip. If you are coming to Juneau in the summer season, chances are witnessing the phenomenal humpback whale is on your Alaskan bucket list. 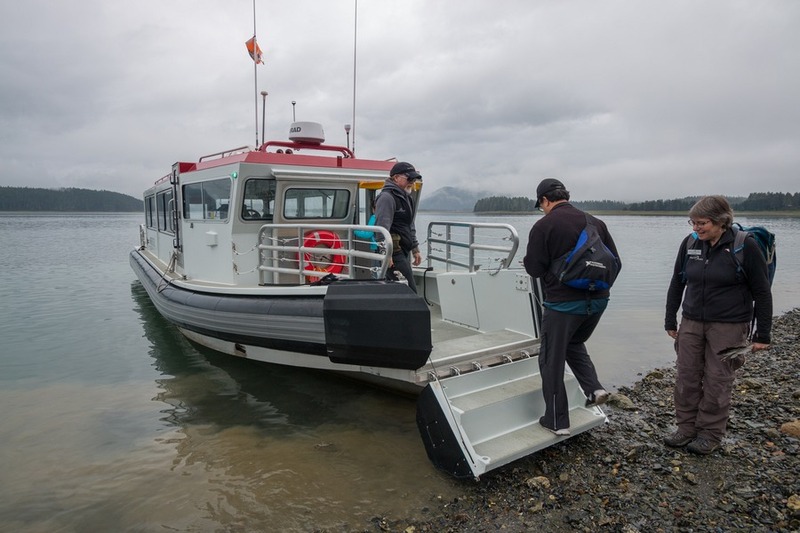 We enjoyed an Alaska's Whales, Glaciers & Rainforest Trails tour with Gastineau Guiding. Our day started with collection from downtown and our small bus of fellow tourists headed to the Tongass National Forest. A tranquil walk through its shaded forest path was a delight to all the senses. The wooded earth smell, the soft steps on gentle leaves, the green hues changing as we made our way through multiple stages of the growth process. And it ended on the water’s edge where the kids collected seashells. Previously on the bus our guide offered snack bags including apples, granola bars, and a bottle of water. At the harbour we boarded a custom safari vessel and headed out to the open ocean in search for the mighty humpback whale. The experienced guide pointed out landmarks, shared some of the region’s history and tips for best finding the local wildlife. Pretty soon we spotted a whole island of sea lions. And then we closed in. 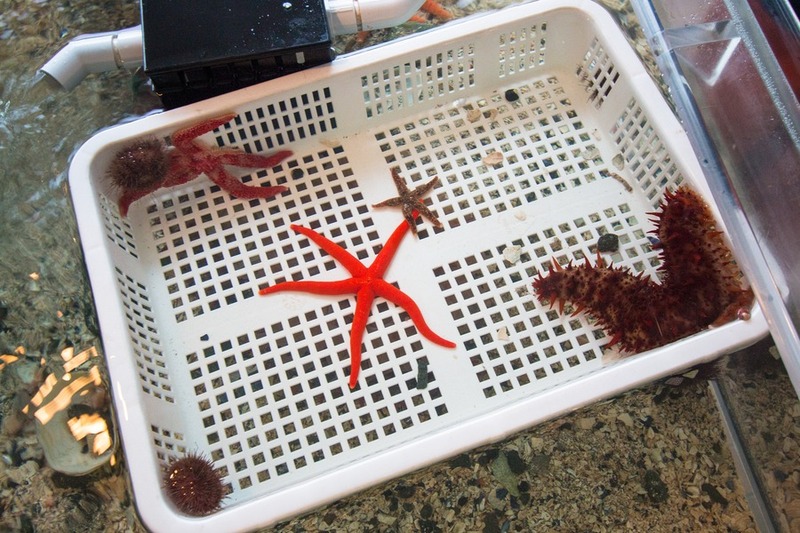 The captain helped us locate and identify the gentle giants of the sea. Boat windows were opened and we were given permission to stand on the stern and bow to watch the whales. Soon we observed a flock of seagulls floating above the ocean. With loud squawks they screamed and dove into the churning ocean in an attempt to catch the herring rising to the surface. And then they suddenly retreated flying to the sky as a pod of humpbacks whales breached the surface consuming the food with gaping mouths. A rare phenomenon known as bubble-net feeding where the whales work together to capture large schools of fish. Beautiful and captivating. I couldn’t get enough. And it was all too soon before the captain said it was time to head back. A phenomenal tour I’ll never forget! Love salmon? 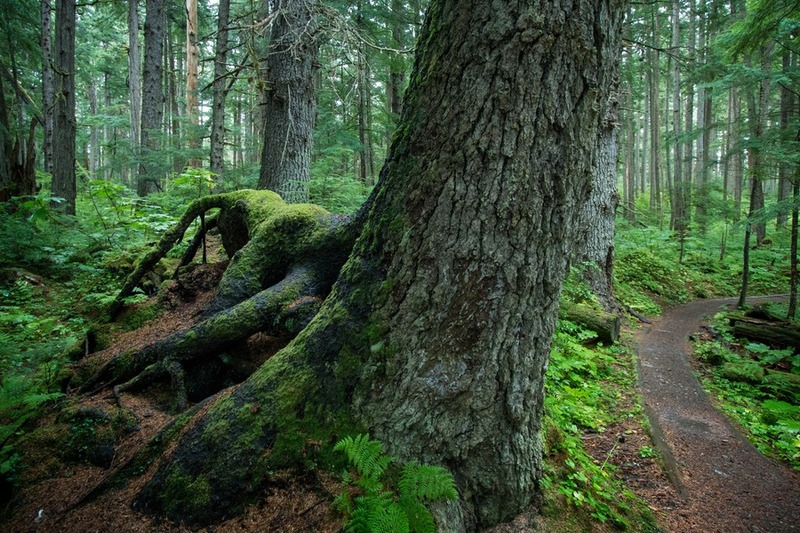 Then Juneau will be your dream destination. 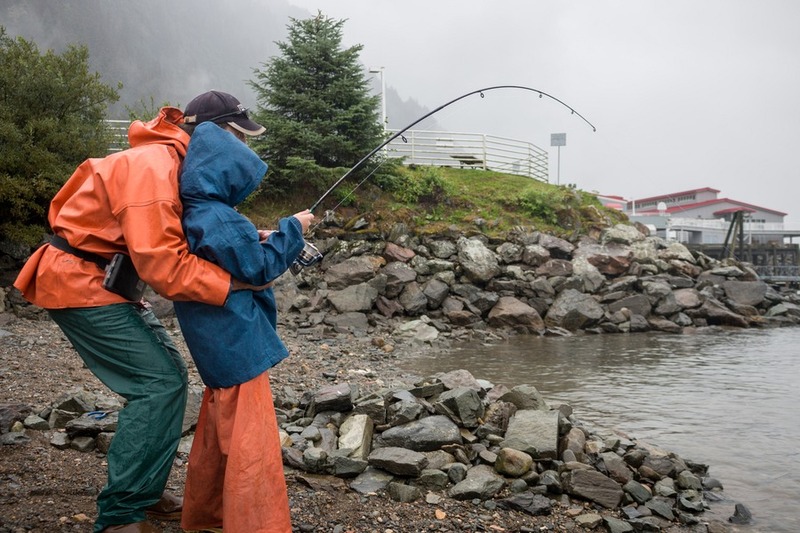 Whether it’s watching, fishing, or eating, Juneau has each on offer. 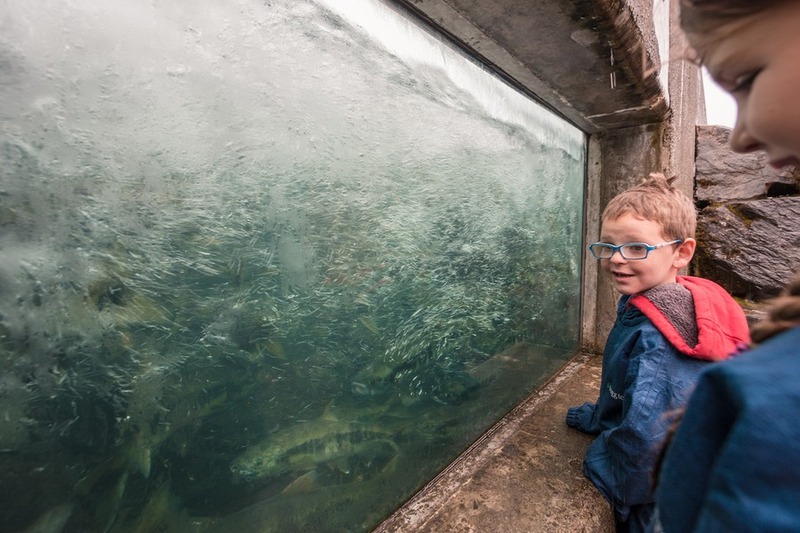 The Macaulay Salmon Hatchery is a fun place for all ages. It houses a small educational aquarium (including a touch pool) that the kids will love. But outside is where the real fun is. 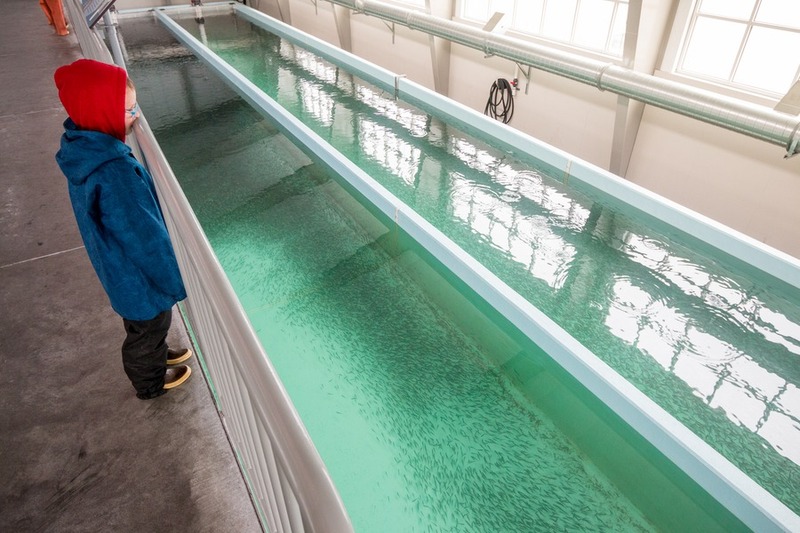 Watch thousands of salmon attempt to swim upstream against all odds thrashing and jumping all the way to return home to the hatchery. It’s fascinating and if you head down the ramp you’ll see a glass window to get closer to the underwater action. 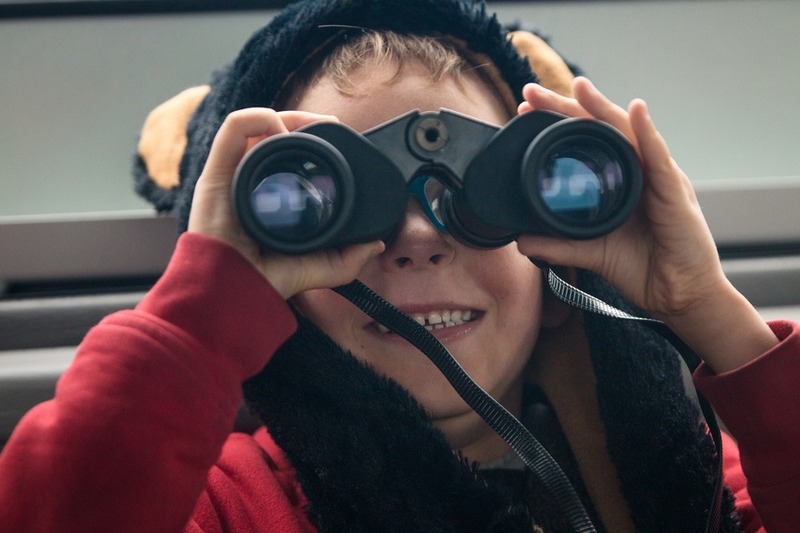 And keep an eye on the surrounding bay as you may even be lucky enough to catch a glimpse sea lions enjoying the all-you-can-eat salmon buffet. If you’d rather be eating than watching, consider going on a fishing trip with Chum Fun Shoreline Fishing. We arrived at their store located downtown excited and a little scared. The friendly couple running Chum Fun were such a delight we immediately felt at ease and ready to take on the salmon. Chum Fun provide an array of fishing overalls and boots for you to borrow to avoid getting wet and cold. 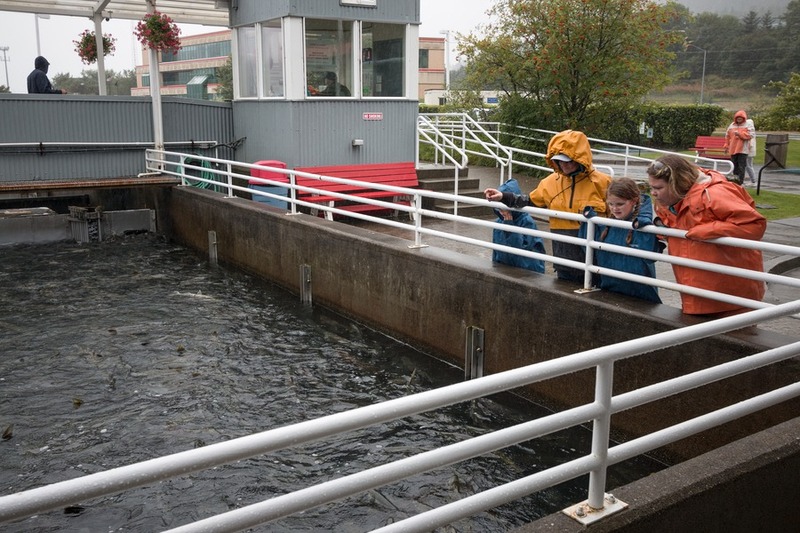 Once the whole family were dressed we hopped in their van for the short ride to the Macaulay Salmon Hatchery. Located next door is a pier where we stopped for our first family salmon fishing trip. The kids were naturals and with the help of our guides they were casting their lines back and forth so easily. We moved from the pier to the shore and started up again with wins all round. Even for Josh who managed to score a fish skeleton! Time passed so fast, the sun quickly fading and cold slowly starting to seep in, so we joyously returned all our salmon back to the water so they could live to fight another day, and headed home. 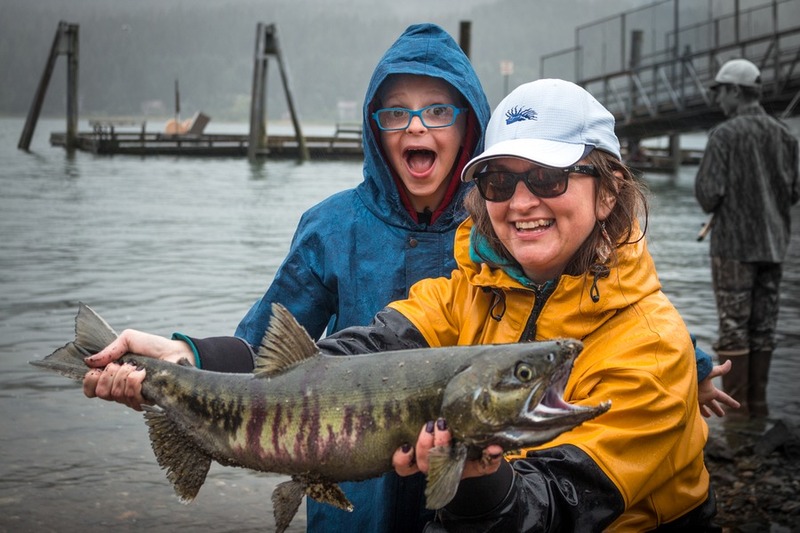 If you love salmon there’s no need to return, Chum Fun have a license allowing you to take home and enjoy your very own fresh delicious dinner. But if you prefer someone else to do the hard work, there’s no shortage of fresh seafood restaurants in downtown Juneau. Alaska is home three different types of bears and if you are lucky you will spot a wild sitting calmly on the side of the road in Juneau. Well, maybe not sitting. Or calm. But you may see one. We struck it lucky on a visit to Mendenhall Glacier where a black bear wandering across the road. Remember to keep your distance, bears aren’t pets or as cuddly as they seem in the toy store! Who doesn’t love cute puppies? 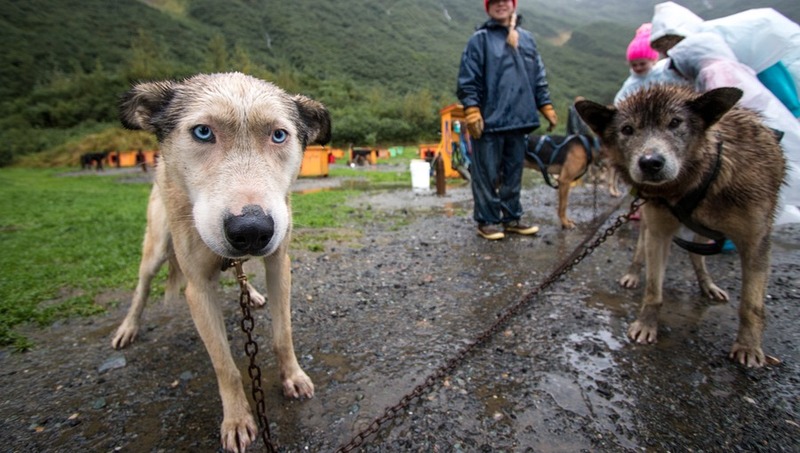 Alaska’s officials state sport is dog mushing. And while they spend winters on long haul jaunts through deep backcountry snow, during their summer breaks they live for a run. A run you can be a part of. 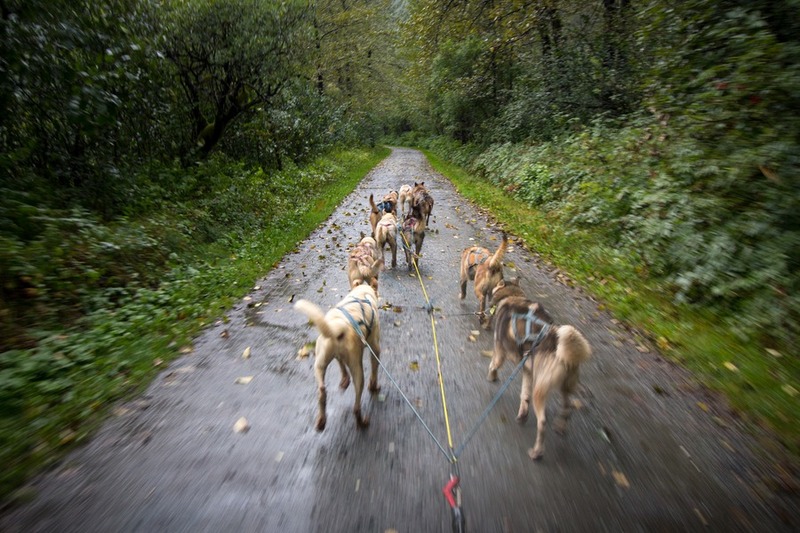 We were collected from downtown Juneau by Gold Rush Dog Tour who took us for a short drive up the mountain. Onsite we were given a tour through the history of dog mushing in Alaska. 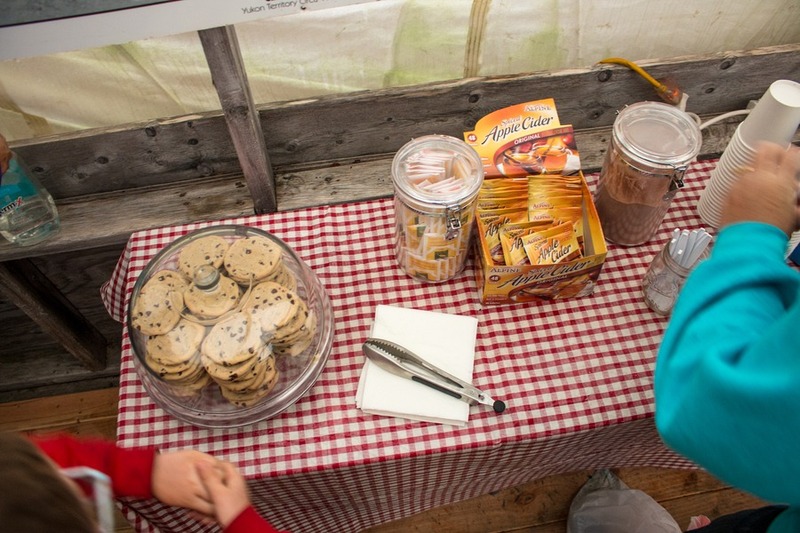 It’s a fascinating story, carried out over several small, cosy wooden buildings and even includes hot cocoa and cookies. The tour incorporated a short movie on dog mushing, we got to touch a real mushing cart and asked as many questions as desired to an experienced musher. After our tour we met our friends who were uber excited to take us on a ride. Tails wagging, howling with excitement, and plenty of adorableness. And that was just our children! No, I’m talking about loveable Alaskan huskies. We boarded our cart (tip: dress warm!) and our musher started the trip. These dogs live to run and you should have seen how happy they were racing through the mountain valley. Gorgeous evergreen trees on our left, waterfalls flowing down the mountain on the right, the sweet scent of nature, dogs, and freedom in your nostrils. 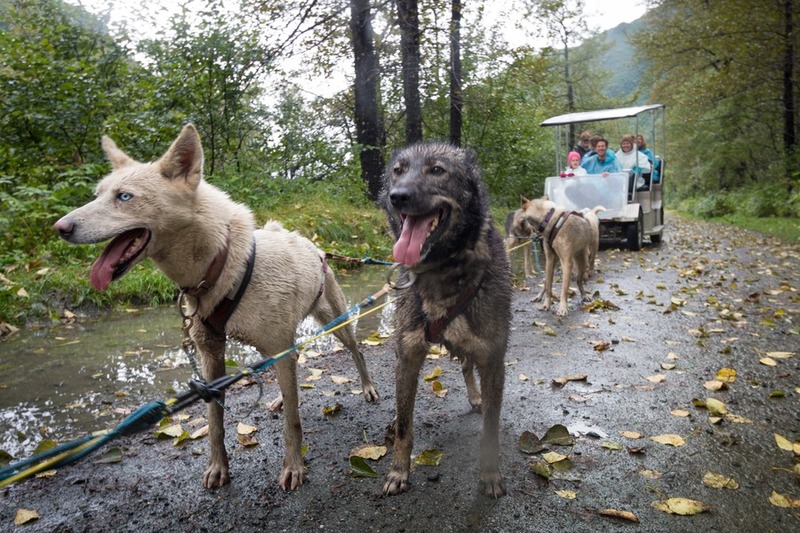 The dogs got so warm on the 20-minute ride that our musher stopped several times to let them drink and even roll around in man-made puddles to cool down. You can tell they are born for the snow. We were delighted to be introduced to the newest puppies of the Sheep Creek Crew. So adorable and so cuddly! Mum was not fond us sharing them too long so it was far too soon before we were handing them back. 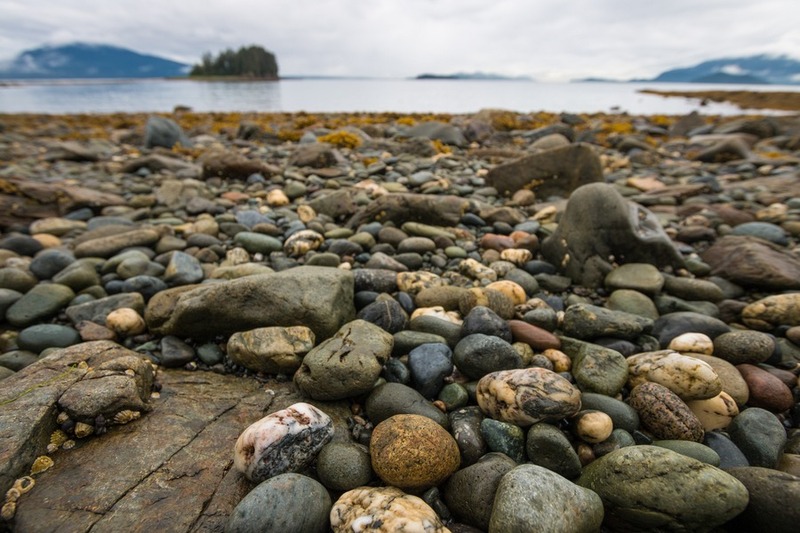 Don’t miss this experience while in Juneau! It was a family favourite. And such a different experience to our husky sled ride in Finland. 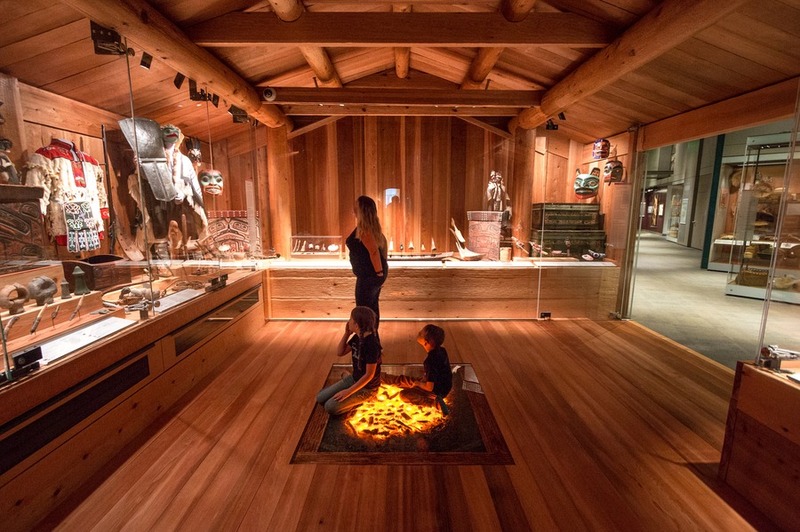 The final point along our Juneau wildlife tour is the Alaska State Museum. 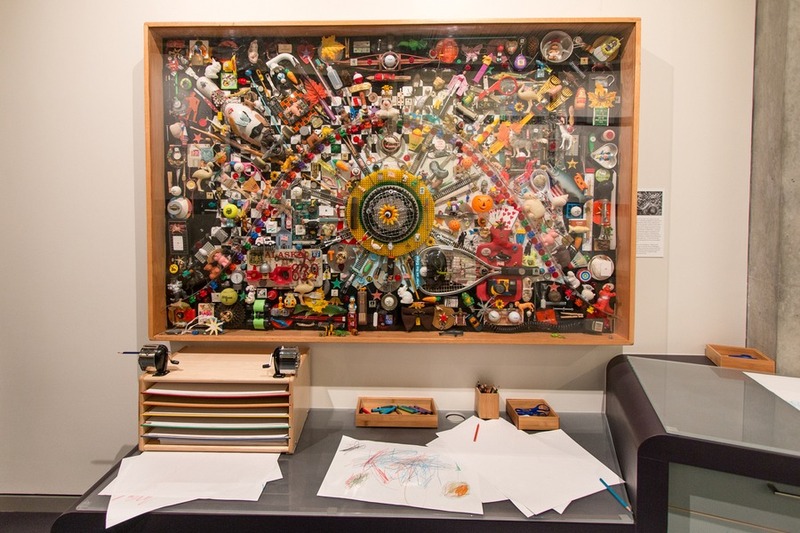 Established in 1900 and recently renovated, the museum collects, exhibits, and interprets the human and natural history of Alaska. 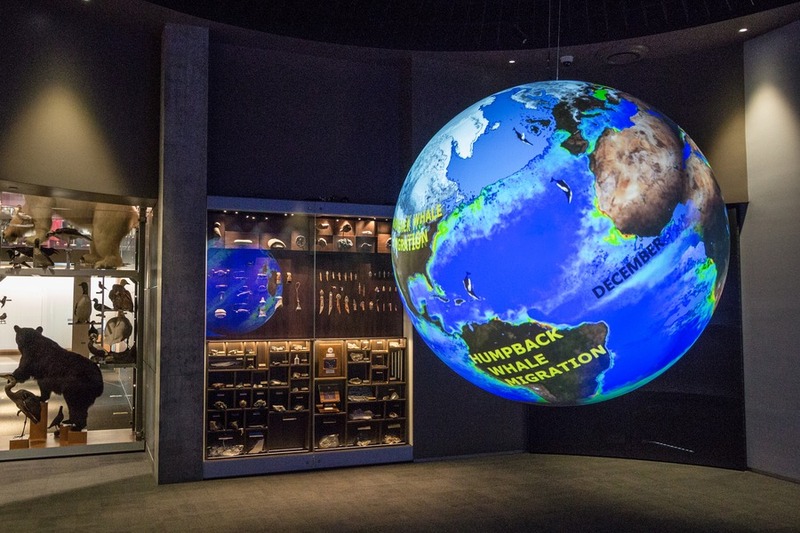 Amongst that is a natural history collection of approximately 1,200 seashells, minerals, skeletons, fossils, and mounted animals and birds. 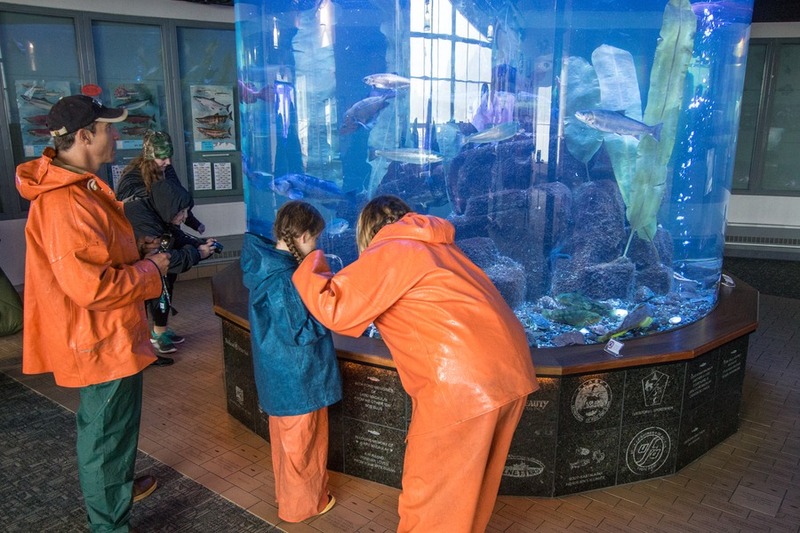 Our kids had an exciting time discovering the Alaskan animals and loved the interactive section built just for them. Plus, the brand new building is warm and easy to navigate. A fun few hours indoors for those rainy Juneau days. 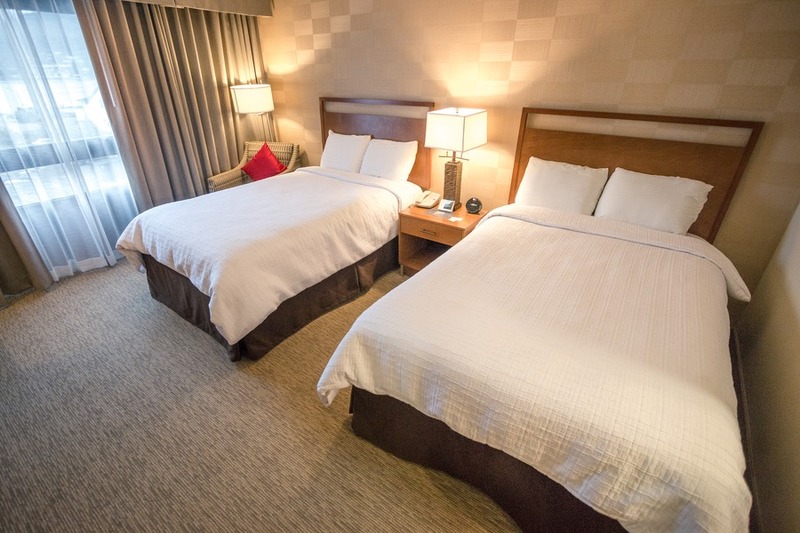 We stayed in the Four Points By Sheraton (previously Goldbelt Hotel). 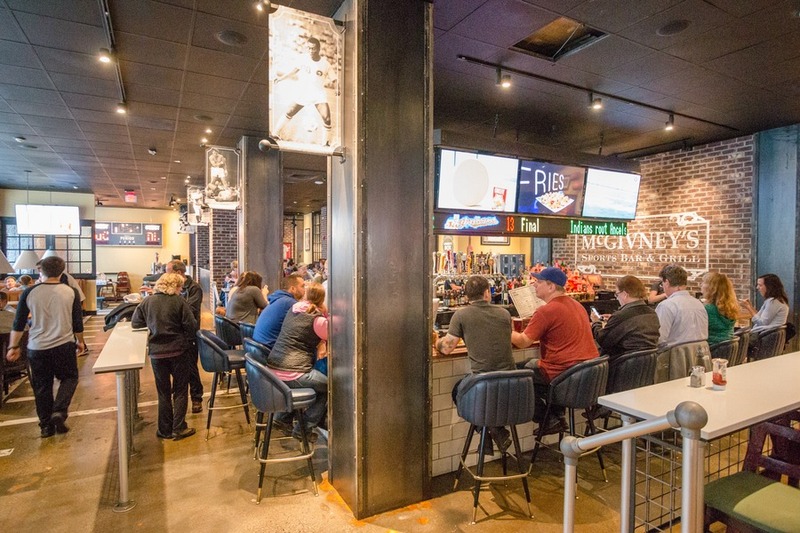 Space was generous and the restaurant next door, McGivney’s Bar & Grill, served up delicious food with generous portion sizes. 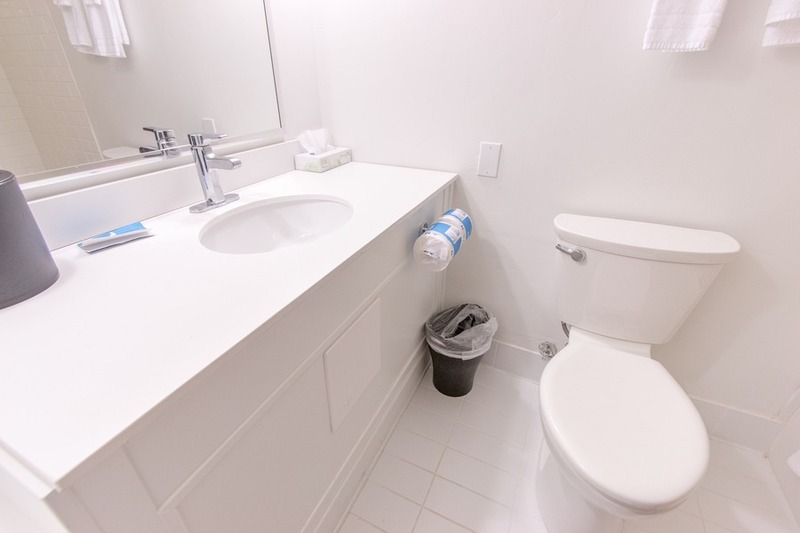 Tip: Ask for one of the renovated rooms facing the sea. 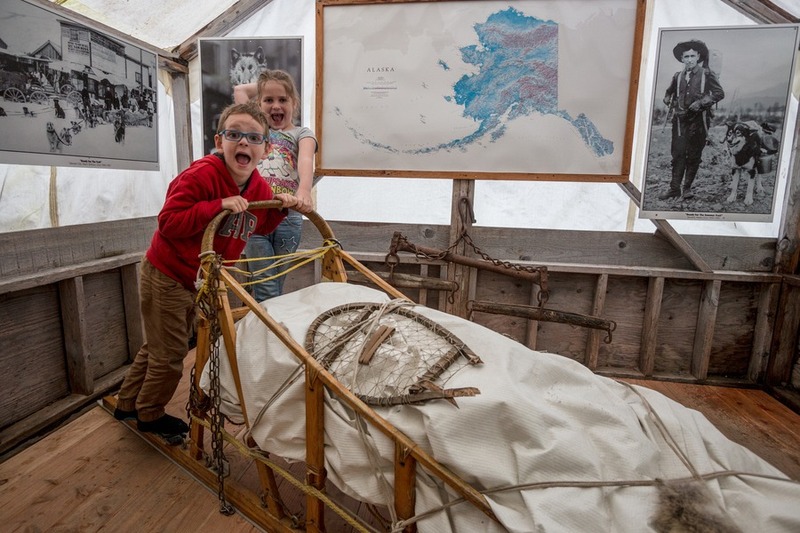 With the incredible scenery of Glacier Bay National Park nearby, and the many family friendly activities on offer, wildlife is just one part of the amazing attractions Alaska’s capital has on offer. If you’ve been contemplating Alaska, now’s the time. Hi Erin and Josh! Great pictures! My kids would go crazy if they see that much sea creatures. Heck, I would go berserk if I see whales all together like that. This must have been an exciting trip. I'd love to plan a trip like this for my family.